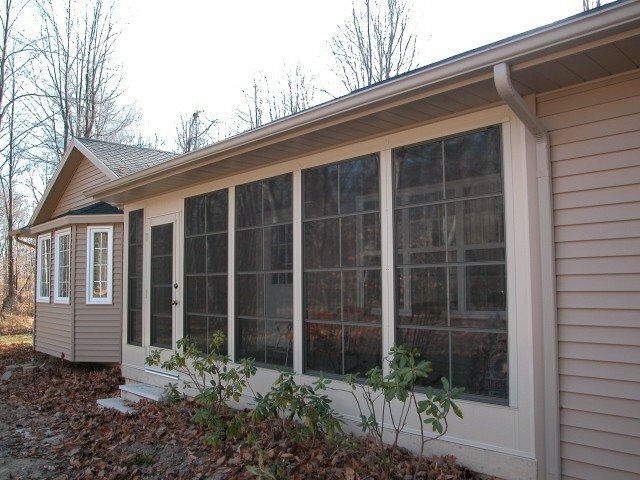 Gutters - Coverup Enclosures is a General Construction Remodeling Company in Mid Michigan serving the Areas of Grand Rapids, Lansing, Ionia, Lowell, Grandville, Greenville, Portland. High quality work and energy efficient work and products have kept us open for over 25 years. CoverUp Enclosures installs seamless gutters and a variety of gutter covers, which is an extremely important home improvement to reroute rain that falls on the roof and funnel the water to the downspout on the ground. This directs it away from the foundation of the home and prevents the ground from becoming waterlogged and potentially leaking into the basement, or causing other damage to the structure as well as surrounding landscaping. There is a wide range of colors (32) to choose from. Gutters also prevent the “waterfall effect” which occurs when rain runs down the roof line which makes entering and leaving the home less than desirable. Why let rain water cause potential problems to the foundation of your house? That’s really the bottom line. CoverUp Enclosures can help you protect your home from water damage with seamless gutters and gutter covers. CoverUp Enclosures has 32 colors for you to choose from. That’s a lot of colors! Not sure which one? They can help you decide. When you call CoverUp Enclosures to do your gutters, you can be certain that they will do the job right and will give you seamless results. As Benjamin Franklin stated, “An ounce of prevention is worth a pound of cure.” Installing gutters is proactive and smart. Are you running through a waterfall when entering or exiting your home? It’s time to call CoverUp Enclosures and fix that problem.